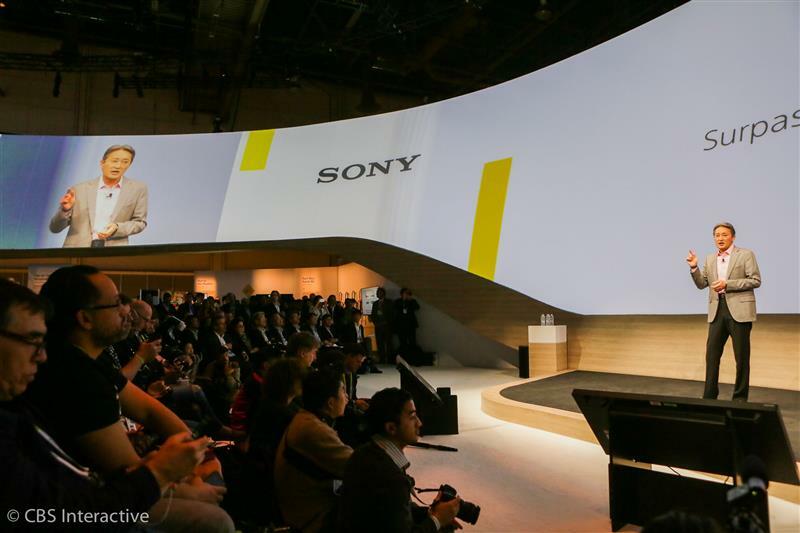 Sony takes center stage at CES to outline its plans for 2015. Hey everybody, I'm here finally. Hopefully my connection holds out. Just in time for PlayStation Vue. Hirai touts PlayStation Vue, which brings live and on-demand video content. 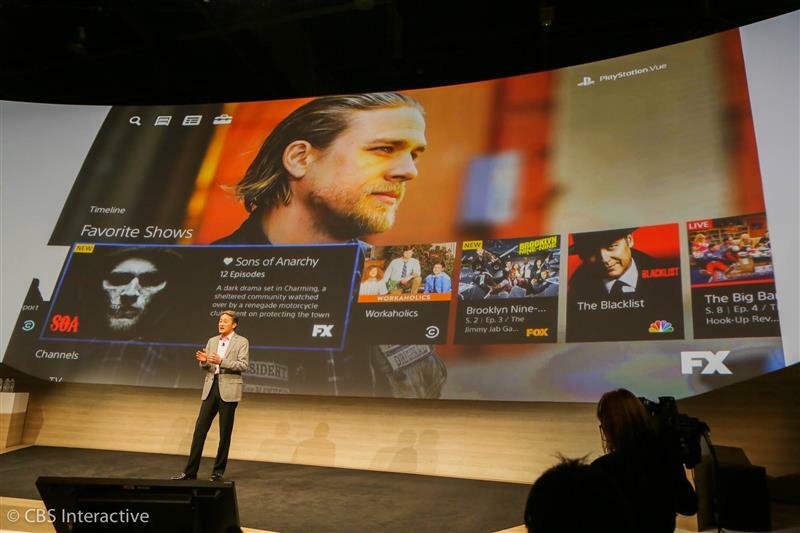 Playstation Vue will allow you to watch TV on your terms and schedule, he says. You're in control. Playstation Vue has begun an invite-only beta preview for select PS4, PS3 owners. Along with the Dish OTT announcement, does Vue help make this the CES of the Cord Cutter? Playstation Vue will launch commercially in the first quarter of this year. Now on to image sensor technology. Sony continues to be the leader in this space, he says. Sony imaging tech can gather visuals that even our human eyes can't perceive, he says. "Surpassing human vision" is the tagline on the screen. So what's the point of capturing things our eyes can't see? It's like a visual dog whistle. I'd rather spend the bandwidth on improving PQ issues I can actually perceive. Hirai talking about the Alpha 7S camera, Sony's flagship product. You can capture great images even if you can't see things with your own eyes, he says. Sony now shifting gears to automotive. 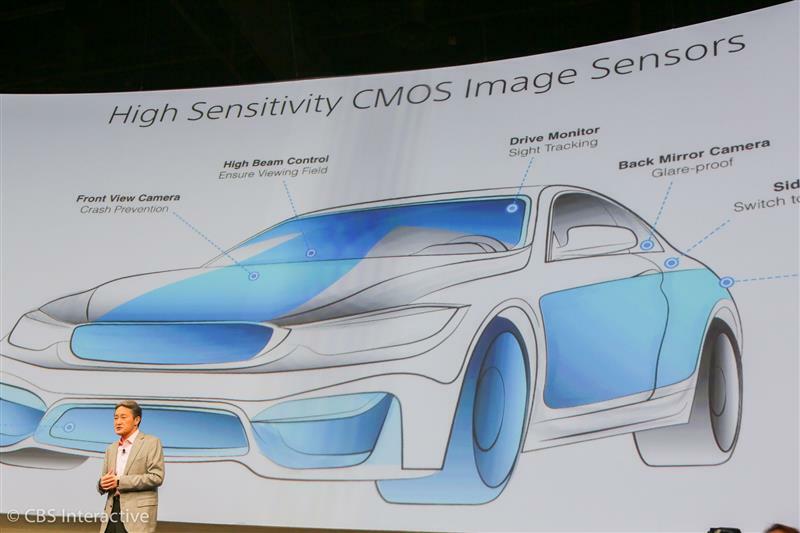 Sony's advanced image sensor can find its way into the automotive segment, Hirai says. 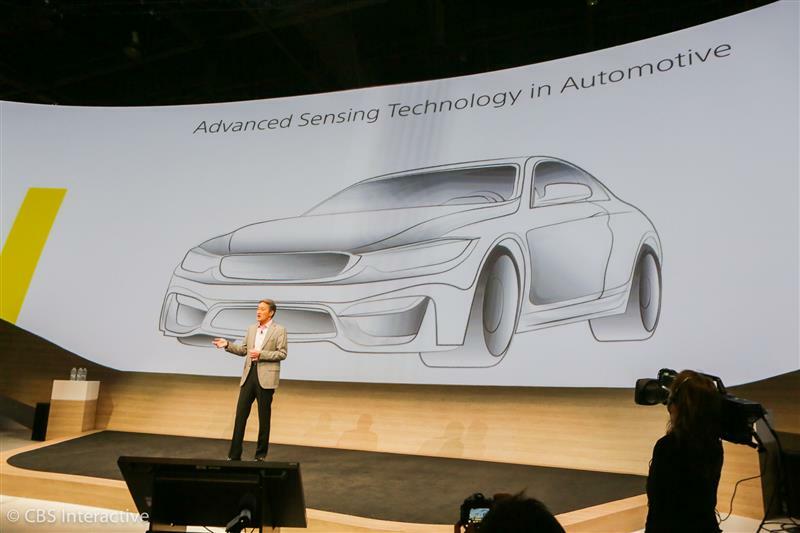 We're aiming to taking a leading position for advanced sensing tech in the automobile industry. We anticipate our imaging and sensing expertise will help automakers create more advanced driving systems, he says. Ah ha! Cue the self-driving car references. A chart pulls up to show off a car using sensors for parking assist, crash prevention, sight tracking, etc. The front view camera is labeled "crash prevention." 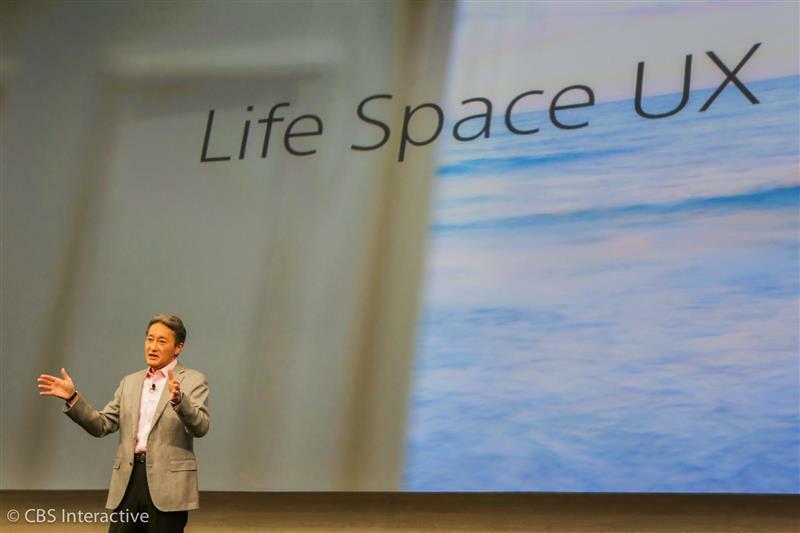 Sony has a concept called Life Space UX, a new way to experience audio and visuals. It lights the ceilings and walls, giving them life, he says. It's a concept we're passionately pursuing at Sony, he says. It will offer a seamless viewing and listening experience in your home, he says. Life Space UX was introduced at CES last year, and it makes a really cool demo. Interacting with projection images, ambient light coordination, etc. He touts the 4K Ultra Short Throw Projector. 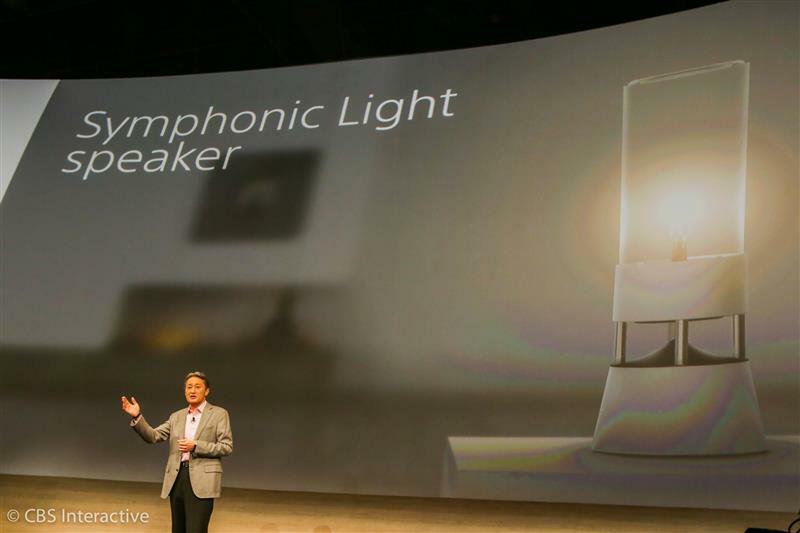 Sony showcasing the Symphonic Light Speaker, which is a lamp that radiates music. It's pretty slick. It has a crystal clear sound with a proprietary vertical drive tech, he says. 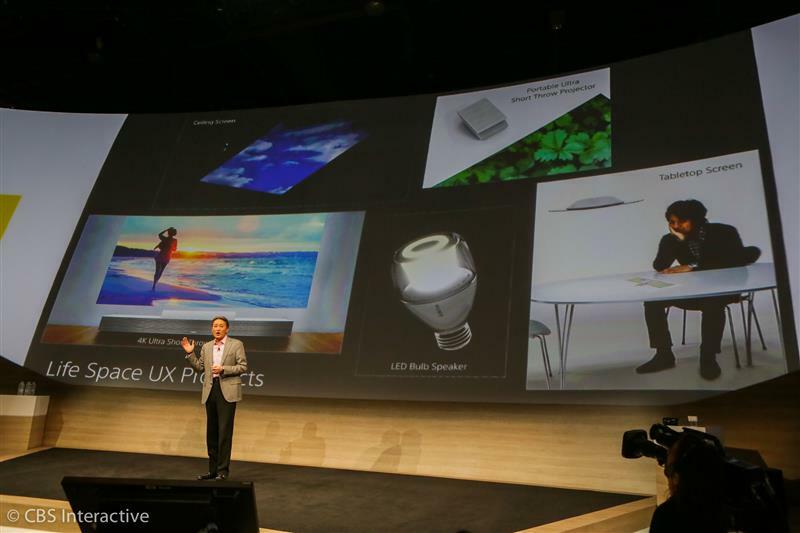 If you're keeping track at home, Samsung also announced a style-first omnidirectional speaker. It didn't light up though. I'm hoping I can mute the lamp with a touch. Or a clap. OK, this is one heck of a preamble. 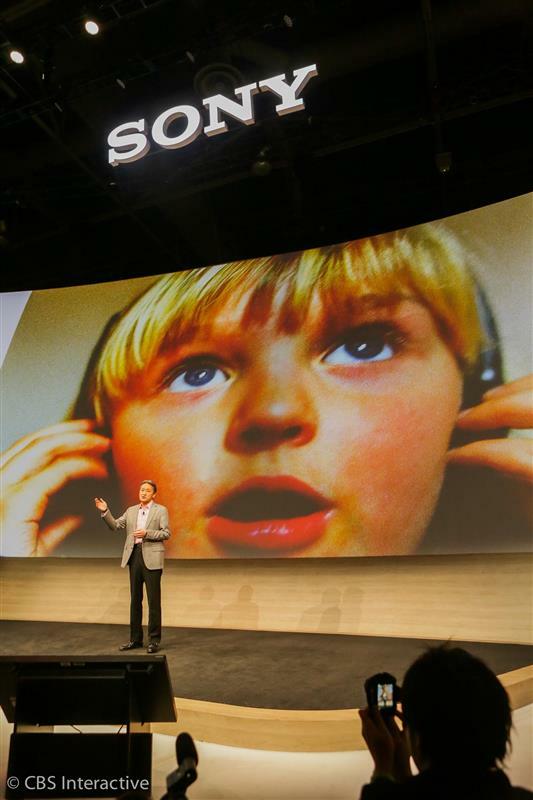 Sony has accelerated its transformation effort since he took over in 2012, Hirai says. Sony's efforts are focused in areas where it can outperform the competition, Hirai says.